Sprint today announced a brand new smartphone made by LG - the LG Tribute Dynasty. As expected, the LG Tribute Dynasty is - just like its predecessor - a low-end device that's made for users who don't want to spend more than $100 on a new phone. Sporting a 5-inch display with 720 x 1280 pixels, the LG Tribute Dynasty is powered by an octa-core MediaTek processor, coming with 2 GB of RAM and 16 GB of expandable storage space. The handset further features 4G LTE connectivity, a 5MP front-facing camera, an 8 MP rear camera, and a 2,500 mAh removable battery. Unfortunately, the Tribute Dynasty currently runs Android 7.1 Nougat, and it's not clear if it's going to be updated to Android 8 Oreo. In case you're wondering, what seems to be a fingerprint scanner on the back of the LG Tribute Dynasty is likely just a power button, as there's no mention of a fingerprint sensor among the phone's features. 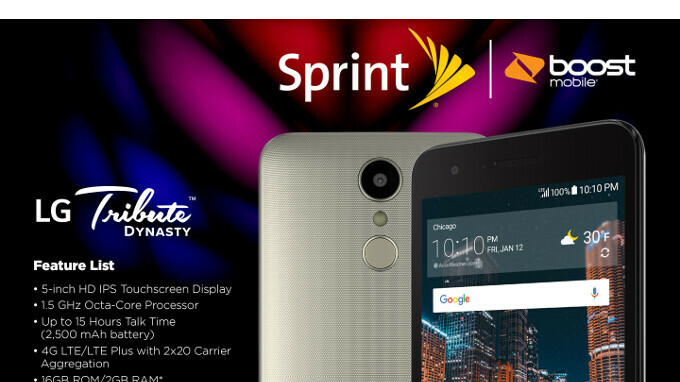 Sprint will start selling the LG Tribute Dynasty on January 12 for $99. But the new smartphone can already be bought from Boost Mobile - one of Sprint's prepaid brands - for just $59.99 (plus tax). The handset will also be available via Virgin Mobile, although it's not clear when this will happen. I thought Virgin Mobile is iPhone only now?